Both Hands is an innovative business app for sports coaches, helping users to organise their time, engage with clients and grow their own business. Coderra was initially approached by the Both Hands team to build an accompanying coaching website using a simple theme, which would allow them total control over the website content as well as providing an attractive and functional base for the promotion of the app. The team here at Coderra set up the theme on behalf of Both Hands, filled with demo data which could be amended by Both Hands when we handed over the site. Both Hands took care of the content when they took over the website, filling it with compelling copy which will resonate with potential customers. The logo and the branding for the app were already set in stone, so it was up to us to create a theme and a website which would complement and enhance the existing colour scheme. We styled the site to ensure it aligned perfectly with our clients’ demands and the idea they had for app’s brand image. We love it when clients know exactly what they want, and the Both Hands team were very specific. We tweaked the theme for them, removing parts which weren’t relevant or necessary, and changing the functionality to ensure that it met our clients’ needs, and the needs of their site visitors. The site is beautifully responsive, which means it can be displayed on any platform (laptop, smartphone, tablet device) without the need for endless pinch-zooming or scrolling to find the right information or to navigate. 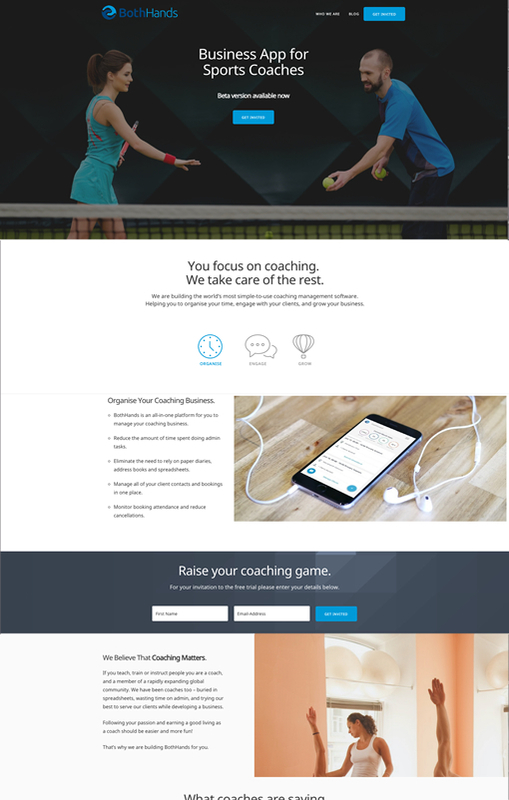 With a blog, a members-only section and an area where users could sign up for a free trial of Both Hands, there were challenges on almost every page for the Coderra team, but we managed to create a functional and aesthetically beautiful coaching website which will support the app perfectly.